Lil A is a big fan of idli and dosa. We have it every week. 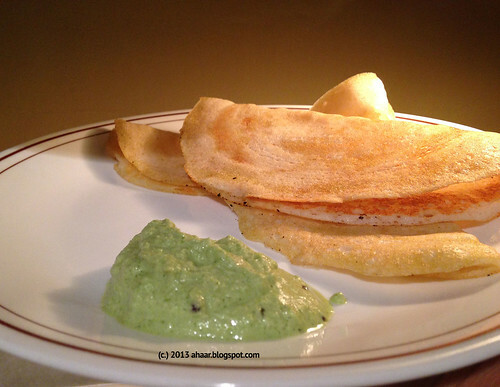 Till now, I used to take the easy route when it came to idli and dosa batter. I just bought it from the store. But this year, my MIL was making it from scratch when she was visiting us and I really tasted the difference - the idlis were soft and pillowy just like one reads about, and the dosas were crunchy and light. When she was leaving this time, I wasn't sure if I wanted to go back to store-bought batter. I also wasn't sure if I would do it at home, you know, I don't have any of the special grinders. But the taste of homemade idli lured me. Before my MIL left, I asked her for her recipe. She had some measures "2 cups of rice and 3/4 cup of lentil" and not so much for the other things "you know how much water to put, you know how it should be." So after she left, I decided to try making it from scratch on my own a couple of times and noted down the water measurements too. It takes some time for it to be ready, but once you taste the homemade goodness, there is no going back. You want to start with idli rice - buy the whole grain one, and whole peeled urad dal. With the below listed quantity, I get enough batter to make idli for all of us and just enough for quick dosas too. Soak 2 cups of rice in a bowl. Soak 3/4 cup whole urad dal and 1 tbspoon methi seeds together in a bowl. Let them soak overnight and you will see little bubbles in the urad dal bowl. Drain the water and dal till they are almost dry. Grind the dal dry once, and then add 1/2 cup water and grind again. Then add another 1/4 cup and grind some more till it becomes a find paste. Do the same for the rice, do a dry grind and then add 1/2 cup water and grind, and then another 1/2 cup and grind till it becomes smooth. Since I don't have any special grinders, I just use the Sumeet mixie that I got from India a few years back. Now add the dal and the rice together and 1 cup of water. It should make a thick batter. Let it sit overnight in a warm place like the oven with a light one or in a hot case or just wrap it with a blanket. 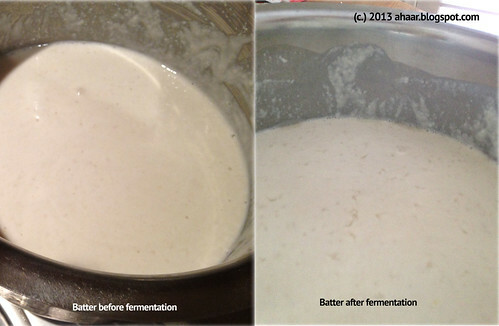 The next day you will notice a frothier batter which probably has doubled. Keep it in the fridge. The batter is now ready for idli or dosa. Add salt to the batter just before use. 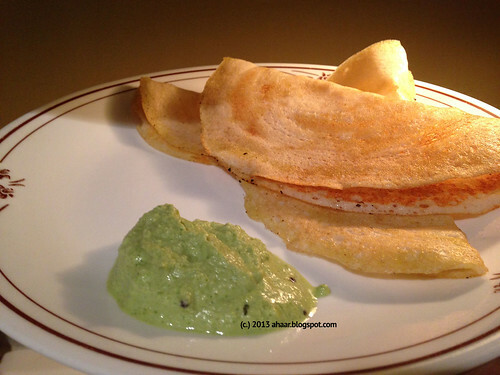 Heat a flat pan, take about 1/2 of batter add another cup of water and make thin crepe-like dosas. Serve with almond chutney for a busy weeknight dinner.